Mr. Bernd Appelt delivers his speech during the launching event. The national dissemination workshop of the revised National Policy and Safety in Health and Quality Improvement Master Plan (2017-2021) was organized by the Department of Hospital Services of the Ministry of Health on December 29, 2017 supported by GIZ Social Health Protection Programme (SHPP). The event was presided over by H.E. Professor Thir Kruy, H.E. Professor Yit Sunnara and Mr. Bernd Appelt, SHPP Programme Manager. All provincial health directors, leaders, health partners and other key stakeholders were invited to this important event where the contents of these two documents have flown along the public health practitioners to reach the implementation level of all 25 provinces and municipalities. Presided by H.E. 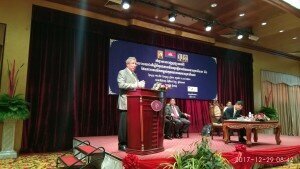 Prof. Thir Kruy, the National Dissemination Workshop on National Framework for Quality Improvement. 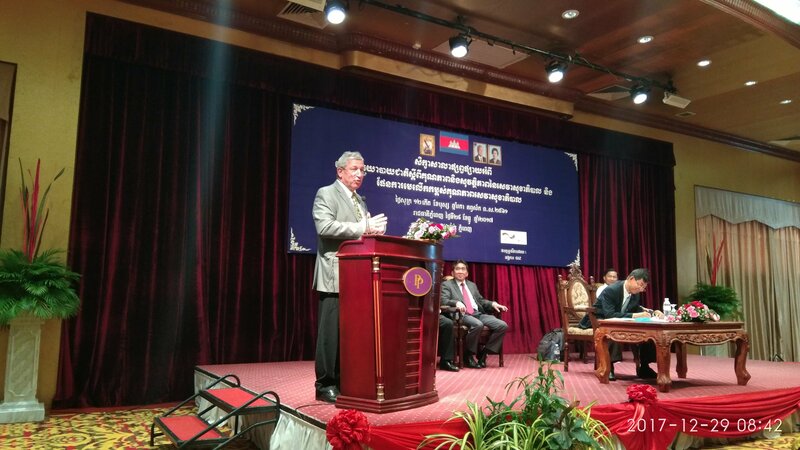 The “National Policy for Quality and safety in Health” is a key document that provides a guiding framework to support all the efforts made to ensure patient safety, quality assurance and improvement in health care and services in Cambodia. It does so by streamlining and setting the direction for activities of the public and private sectors, so as other stakeholders, while including the alignment with international initiatives for patient safety and quality of care. This guiding framework is translated into a Quality Improvement Master Plan that articulates and harmonizes the implementation of all building blocks of quality improvement activities. As a result, it is expected that the public, especially the poor and vulnerable groups, will have more equitable access to health services with appropriate quality so as defined in this framework and guiding principles.